Black Berkey Purification Elements may be called a Berkey water purifier because they remove not only bacteria and parasites but also viruses >99.999%. The unique Black Berkey elements combine the age-old process of micro-porous filtration coupled with modern state-of-the-art technology and the highest quality materials to bring you the finest water purification system available anywhere. 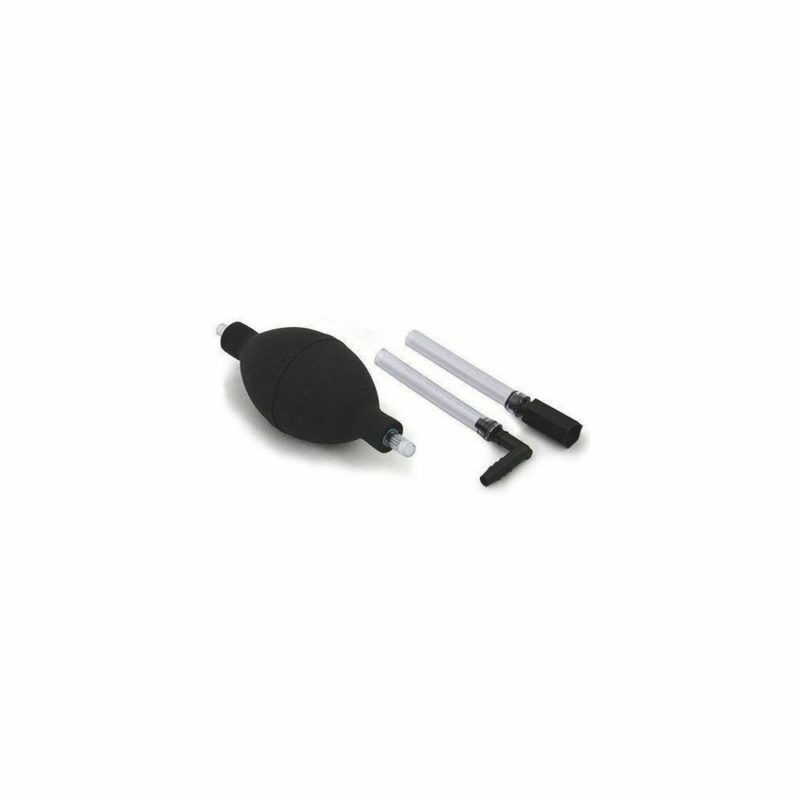 The micro-pores within the cleanable Black Berkey purification elements are so small that pathogenic bacteria are simply not able to pass through them. No need for expensive disposable filters. Black Berkey purification elements are re-cleanable. This advanced technology was developed, refined, and proven through years of diligent, investigative research and testing performed by water purification specialists, researchers, and engineers. The flow rate or time of exposure through the exclusive Black Berkey elements has been calculated to yield the greatest volume removal of toxic chemicals and pathogenic bacteria found in nature and caused by pollution from industry and agriculture. It is excellent for everyday urban, rural and survival water purification. Doctors recommend people to drink 8-10 glasses of water a day. But this logical elucidation has no evidence or proof that this is true. Still, drinking water when we feel thirsty somehow rehydrates our body, especially during the summer season. As time passes by, bottled water is preferred over natural water sources by most people worldwide. But not all bottled waters are safe to drink; there are some that are contaminated by dangerous disease-causing bacteria and unwanted chemicals. 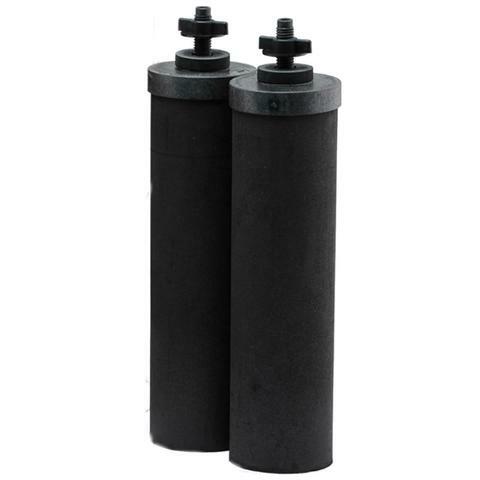 When these contaminated water existed, products about purifying water also emerged like as our Berkey Water Filter and the heart of Berkey is the Black Berkey Water Filter Element. 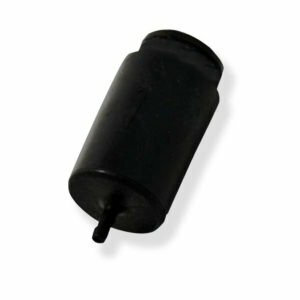 What is Black Berkey Water Filter Element? Black Berkey Water Element is a water purifier that removes 100% of pathogens and any unwanted toxins in the water. Each Berkey can carry or filter water up to approximately 3,000 gallons, and a set of 2 filters can purify water up to an incredible of approximately 6,000 gallons. 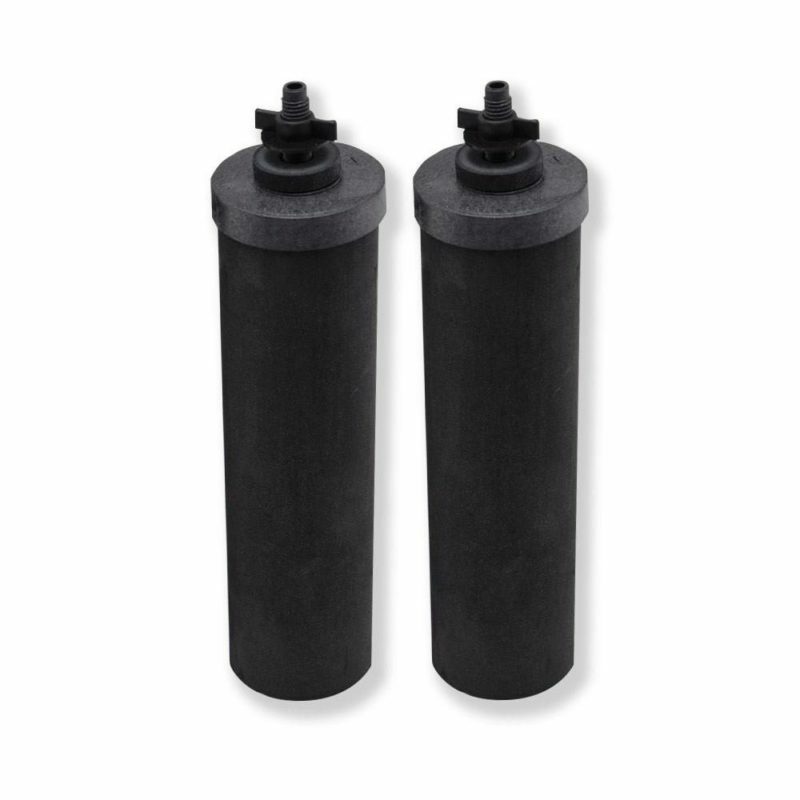 Because of the Black Berkey filters’ versatility, it fits off-brand gravity filtration systems and gravity water filters that can be raised to a purifier with less effort. 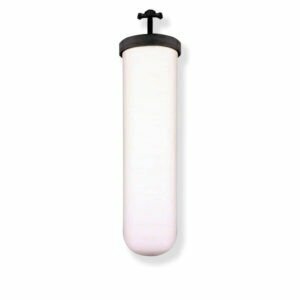 This excellent value replacement filter massively develops other housing trademarks ability to eradicate unwanted water chemicals. The innovative Berkey purifier elements are so powerful or dominant that they can eradicate food coloring from any source of water without eliminating any of the helpful minerals your physique needs. We bought our Berkey in 2006 and never used it. We kept it for emergencies. When we moved to the PNW a year ago, we were on a well with high sulfur content – makes for NASTY HEADACHES (made it feel like our brains were swelling) especially when you are allergic to sulfur. We pulled out the Berkey and within 2 weeks were headache free after 2 months of suffering. The two filters that came with the Berkey had worked perfect, and we have added in 6 more (we have a family of 10, so lots of water needed). What I’ve found is we do get slime on the filters and you know it is building because the water filtration decreases. About every 6 weeks I take them out and clean them carefully, reassemble and the filtration works really well. We’re into year 2 with the same 8 filters, including the two from 2006, and no problems. I also figured out an easier way to prime the filters – use a small straw (looks like a cocktail straw) and place them into the filter and HOLD IT. Then use a 35 cc syringe without a needle, you can get these online or through a vet, feed store, etc. The straw goes into the chamber and as you push the syringe of water through the straw, the water level inside rises and releases air around the straw. 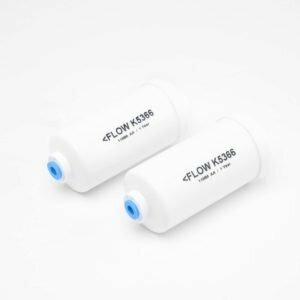 Fastest, least messiest way to fill the chambers ever – works incredibly well and uses much less water to prime the filters with. The filters themselves work great – if it weren’t for the Berkey I would be in serious trouble with the crippling headaches I had from the water here. Berkey’s aren’t supposed to remove sulfur that much apparently, but they do, so I am really really happy with them. Not one single problem yet with the filters. I do have backup filters just in case, never know when we might need them, but hopefully we can keep using the ones we have for a while. Great product!! We’ve been using the Berkey system for a few years now and live the quality of water and taste that it provides. May seem a bit pricey but it is well worth the money. I recommend this item if you are hesitant about using tap water and the filters last a long time. Great filters, my second pair in 2 years. I kept them clean and they did the job to the very end, I think they could of gone a little longer over 2 years but the bottom half was too clogged thus causing it to filter half as slow and all the cleaning in the world would not of helped it any. Still, 2 years that’s great! Ever wondered what’s inside? I did so I cut the old one open. It has a hallow interior the entire length of the filter measuring 1 inch in circumference with walls of 1/2 inch thickness. Wish they made this things a little more robust. They always have a couple of chips out of them whenever I get a new set. 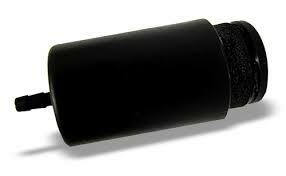 I love these black berkey filters and they last me each a couple of years. It makes our water clean and delicious to drink. These are the worst filters, they are not filtering the water at all, already. Within just a couple days they would only filter half way. I am incredibly dissatisfied with the filters I recently purchased. I even paid for one day shipping. The filters repeatedly failed the red dye test. I tightened the (cheaply made) wing nuts, and still the filters failed the red dye test. So, I watched as it filtered, and the red water was coming directly out of the filter element, not from around the wingnut. I am going to order another set from a different seller and will update my review when it arrives. The wing nuts have always been poorly made and I do wish Berkey made better wing nuts for their filters. They seemed to work at first. now its 3 months later and they are not dripping, the water is streaming thru them so fast that I dont think they are filtering correctly. This can mean a life or death situation for me, and so I think its important that these work! I will not buy berkey filters on amazon again because there is only a 30 day return policy. I will be contacting berkey about replacing these filters. Now I have a sawyer filter from wavesforwater.org to filter my water thru just in case. Here in Hawai’i we have rat lung worm disease that can do worse then kill you, can make you paralyzed. So I must be sure that my filters are working. Its too bad that berkey is the best and yet alot of people seem to have problems with their filters. I hate how much these cost — why is it so hard for us all to have clean water to drink?!? Still, they are exactly as advertised. In fact, I would say they work even better than I thought they would. When these (eventually) wear out, I will certainly buy more. The Berkey filters are the best and, even though expensive, tend to last for a very long time with a cleaning every week or two. My Mom and I love our Berkey water filters. When It was time to replace the fluoride filters I ordered one for mine system and one for my Mom. My filters primed with no problem and the water taste great. I have tried to primemy moms filters 3 times but they don’t bead at all and we’ve changed the water but it still taste like funny. Not sure if the black filters are the problem or we need to replace the white ceramic filters but there only a year old. We buy this alongside the fluoride filter. And the water tastes so much better than tap. Every now and then when the water filter is empty I have to use tap and the difference is huge. The time is takes to filter water is fast. We tried other filters and waited up to an hour for some! We have used Berkey products for a few years now and don’t plan on changing to something else. If you have a loose wingnut you can fix it with plumbers (aka teflon) tape. I have four filters installed. After four years one got so loose that I couldn’t tighten it enough to stop it from occasionally leaking (directly passing unfiltered water). If your filters wobble a lot you can fix them with teflon tape by wrapping the tape around the threading and then tightening the wing nut . Teflon tape is rated safe for drinking water, is cheap, and fairly easy to use. These filters are why I love my Berkey filtration system so much! I originally bought a Berkey because we lived where our well water was too high in fluoride and heavy metals (we used the white Berkey fluoride filters in conjunction with these black filters). Now we live off grid in the mountains and collect drinking water from a nearby stream. We always filter it through our Berkey first, to remove any unhealthy organisms or naturally-occurring heavy metal content, and it’s the best water I’ve ever had. I wouldn’t live anywhere without my Berkey now! Berkey water purification systems are nothing short of outstanding. 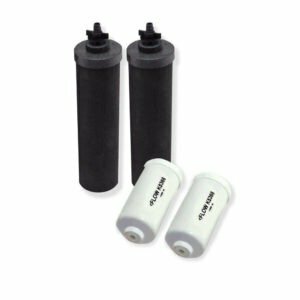 But, the hard packed charcoal filters must be either recharged (Berkey sells a kit for this), or replaced, periodically. I recommend the kit as it allows you to recharge the filters at a fraction of the cost of these replacement filters. But, if you are lazy, or your filters have been compromised, these genuine replacement filters are what you want. They are the same filters that come with the new Berkey system, and are simple to install. 10/5/2017 I had built my own Berkey filter using two 4 gallon food grade Buckets. We started with the Ceramic filters water tasted Great for about 7 Months. Then it stated tasting Nasty. I already had these in my closet since I purchased them a few Month back. The Imperial Berkey filter is around 310 dollars. Two food grade buckets and the filter total was around 120 dollars. so it not as expensive to go this route. My family loves the water and I get the satisfaction of knowing the water is safe for them to drink. It a win win for us since everyone now drinks water in the house. Q Do these fit the small berkey that goes with the go berkey kit? A It will fit, one filter at a time. Q Can they be used as a guarantee to filter out all microscopic bacteria pulled from a pond or lake? A That’s correct. If the aren’t defective. The ones I received didn’t filter a thing. Consider looking outside amazon like at NaturalNews.com for these filters. More likely to be authentic filters. Q One of the wingnuts is not screwing on properly... Is there anywhere I can get just a wingnut? A Yes, just contact the Berkey web site. They have all sorts of parts. Q Does placing ice cubes in the Berkey in any way effect the efficiency of the filtration process? A Haven't experimented with ice water, but can't expect any degradation of filter efficiency as long as the ater isn't near freezing. Might take a few milliseconds longer with the molecules in tighter formation. Debris filtered from the water and building up on the filters is the biggest cause of inefficiency. Q I realize berkey sells the pf-2 arsenic/fluoride filters also. my question is do the black bb9-2 filters remove any arsenic/fluoride? A While the Black Berkey Elements tests do show reduction of fluoride and arsenic, the PF2 Filters are designed to reduce it and are recommended. Q Hello, I'm interested in buying you these filters, I'd like to know their size (height and diameter...) thank you. Q Just got my new filters. they are pouring not dripping and only takes about 10-15 to fill my royal berkey. is this normal? or are my filters broken? A You may want to check the seal. 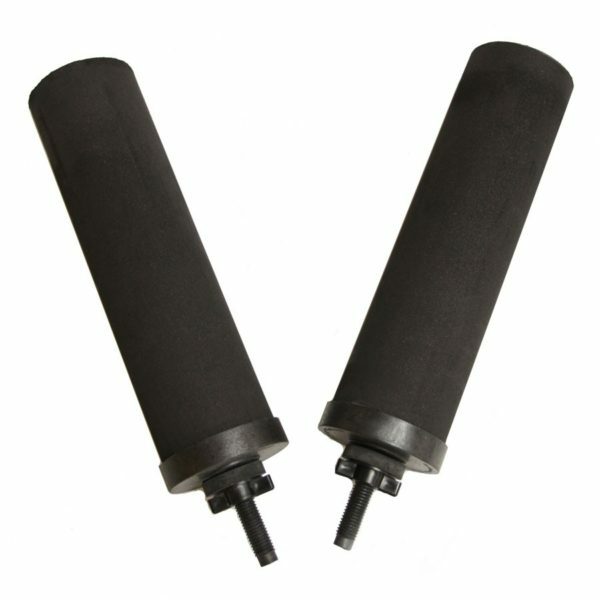 There is a rubber seal that you would have put on the bottom of the filter (inside the reservoir with the filter). 10-15 minutes is pretty fast. I use 2 filters and it takes about an hour or more to fill my travel size (about 1.5 gal). Q How do you clen these filters? A You just remove them and spray them off if needed.I have been using mine for six months daily filtering rain water and mine don't need cleaning.I would think that if you are not using very dirty water to filter that you may never have to clean them unless they get stopped up.Hope this helps. Q Are these filters made by new millennium concepts? i want to know that they aren't some knock offs. A I do not know but for me the water from the filters have been tested by my kinesiologist as good for me. Q If I have been using the Berkey, and then, because I am traveling, have emptied the container and the filters are dry, can they be used again? 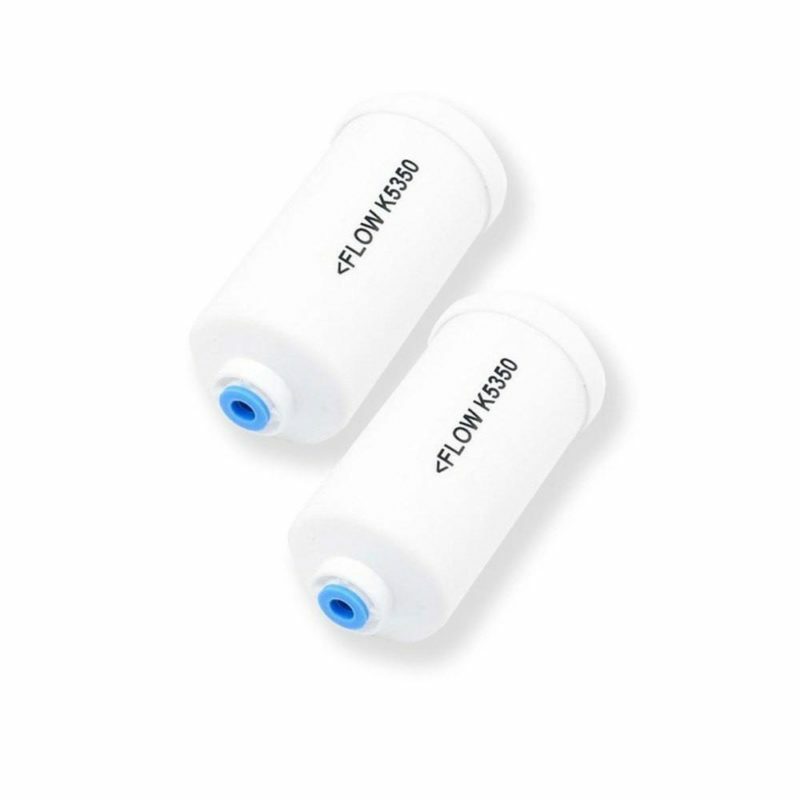 A If I have been using the Berkey, and then, because I am traveling, have emptied the container and the filters are dry, can they be used again? Q I've been filtering my tap water for 5yrs with these. How to tell when they need replaced? A We have a good guess on how much water we filter in a week with our Berkey; with that information we figured how long it would take to put 6,000 gallons through the filters. (2- 3,000 gal filers X 2 = 6,000 gal. That is the only way we know of on how to compute the usage. Q i just switched from the white filters to these. with the white it would drip drip drip. with these the water is running straight thru,is that common? A No. I have the black ones and thy'er supposed to drip drip! Q How do you know when these need to be changed? We've had ours for 6-7 years and the water still tastes great so I'm lost as to when to change these?? A 6000k filtered, but we recommend using 2 to 3 years. A I purchased a new Royal Berkey with four black elements in 2011. I made the mistake of assuming the filters were good. I purchased the filters for emergency events. Two years later I discovered the quality control issue and tested the filters. All four were bad. The return process was incredibly convoluted and I would have received about $50 for $200 worth of filters. My time was worth far more than that. It's not the money. It's the fact you cannot trust the quality of these filters when it really matters. You are now forced to test every filter frequently to ensure you won't sicken or kill your family members. Oh yes. That's what the instructions say anyway. I will never trust Berkey again. Q Do I need to change the white and black filters every 2-3 years or just the black ones? A I have the black filters and you don't need to replace them until they drip to slow to be useful, this won't happen until after many cleanings. It also depends on usage. And if you replaced them every 3 years at $100.00 per pair, it is still cheaper and more effective then other filters on the market. I replaced mine last year after almost 5 years of use. there was just me and my wife here most of that time and we have well water. Q Which filters are better to have during survival mode...the ceramic or the black? Q Contain silver to inhibit bacteria growth? A It doesn't. Try Doulton Ceramic filters instead. Q do these replacements come with the mounting hardware and rubber seals? A Yes. Replacement plastic wingnuts and rubber washers are provided. 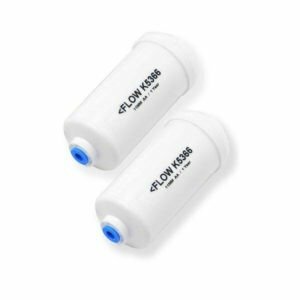 Q Do these filters fit the Go Berkey Kit? A Still an issue. Filters did not get replaced. Berkey is still garbage. We installed a hole house filter system. Q What is in the filters that make them self sterilizing. A Silver is used as an antimicrobial to self-sterilize the Black Berkey elements. Q What is the particle size that the filters block? A An absolute pathogenic bacteria removal rate is a far better gauge because it is more accurate and less subjective (there are various micron/particle size rating standards). 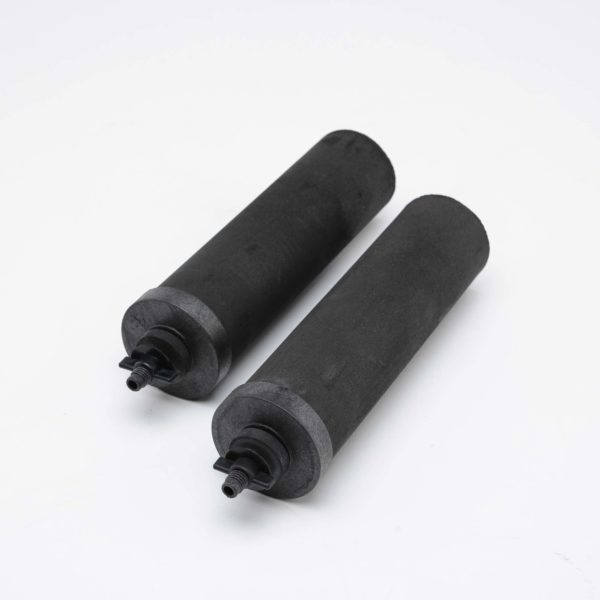 The Black Berkey Purification Elements remove greater than 99.9999999% of pathogenic bacteria such as E.Coli. There are also tests that show how much of each substance the Black Berkey removes, if you're interested in know if it will remove something in particular. Q I am getting a bunch of slippery slime or something on my filters when I use lake water, and it slows flow. Any tips? Maybe add some bleach? A Yes I believe you can use bleach. It should filter out when going through the charcoal. You only need a couple drops of bleach though. Q If the wing nuts on the filter need to be replaced what size are they and where can you purchase them? A I don't see any reason to ever have to replace the wing nuts. When you purchase a new filter the replacement comes with new wing nuts. Q Never heard of any customers having that problem related to dips in temp. A Our Berkey originally came with black filters, so to replace them, I chose the same. I believe the black removes taste and odor from the water. Q Anyone else had the issue where these filter slowly when the room temperature dips a bit in the fall/winter? A Never heard of any customers having that problem related to dips in temp. Q Where are those made? A I looked on the box and paperwork and did not find a definitive answer. 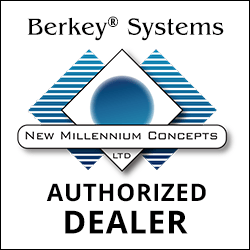 But it does say the Berkey system is manufactured by New Millennium Concepts Ltd located in Texas, USA. I assume that includes the black filters. Q Will these fit the British Berkefeld? A Yes, they will fit British Berkefeld systems. A I would think if they were left in the canister, they'd be fine. It wouldn't hurt to back wash them either. They filter so much anyway. You can find a fact sheet online for them. Perhaps that chemical is listed or contact the maker. Q Why don't these filter chlorine or iron algae? if they don't filter something simple like iron algae, how could i trust them to filter anything else?? Q Do these fit in the travel berkey? Q Do these require that you filter water through them on a consistent basis to prevent them drying out or does that matter at all? A I was told to fill at least every other day to prevent dry out. Iv'e had mine several months and they are still filtering good. I go threw one potful a day. Q I have had my filters about two years and i just noticed a brownish slimy film on them? how do i prevent this from happening? should i be concerned? Q what is that nasty taste in the filtered water? Q How often do the filters need to be replaced? A We filter well water heavy in minerals, tannins, red algae and other disolved organics found in very porous limestone areas of Florida. The water is first pre-filtered as it comes out of the spigot through several layers of soft cotton fabric suchn as tee shirt material. It is then poured into the Berkey. We have been doing this for three years and are still on the original filters. I do clean them every 6 weeks or so with a soft brush as well as wash out any sediment that collects in the upper stainless container. They might last another year with regular cleaning. Either way the cost over time is quite low, and the filtered water quality has been very good.